The Augustus of Prima Porta. At Augustus' feet is his distant relative Cupid, and at the center of his breastplate, an illustration of the standards lost to the Parthians being returned. The Augustan Age will dominate the next dozen or so programs of our podcast. Horace, Virgil, Ovid, and the poets Propertius and Tibullus all worked during the reign of Rome’s first emperor. Their lives were not only affected by the ways in which Augustus refashioned the Roman state. They also had direct financial ties to the emperor himself, often receiving sponsorship for writing works that subtly or overtly endorsed the new Augustan regime and its most powerful agents – Augustus, his right hand man, the general Agrippa, and his left hand man, the cultural patron and administrator Maecenas. Patronage was nothing new in Roman literary history. Before state sponsored literacy, mechanical reproduction of texts, and the spread of copyright laws, a poet either found a patron, or went hungry. What changed during the Augustan Age was that an unprecedented amount of wealth became aggregated in the hands of one person, and that from the Battle of Philippi in 42 BCE down to his death in 14 BCE – for a staggering period of over fifty years – this person was more powerful than anyone else in Rome. Prior to Augustus, consulships and praetorships, terms of provincial governorships, and a ceaseless grind of electioneering all abetted continual change in the personnel who occupied Rome’s highest offices. Because of the short terms of their incumbencies, Roman politicians were constantly vulnerable to the jabs and barbs of a Cicero or a Catullus – moreover there was a crowd of orators and poets schooled in defamation and persuasion and satire who could sway elections, court cases and the passage of laws. This culture of free speech was part of what made Republican Rome operate. In the Republic, particularly before Marius and Sulla, a poet could attach himself to a patron and that patron’s interests without fear of angering some autocrat entrenched at the center of the state’s power. But following Marius, and then Sulla, then Julius Caesar, and finally Augustus, Rome weathered a procession of overlords whose proscriptions and political murders increasingly discouraged the freedom of literary expression. Earlier Roman literature – poetry in the age of Catullus, and his predecessor in satire Lucilius, was often a free for all in which even the most powerful officeholders were exposed to savage, scatological mockery. By the time Horace came of age, however, a more cautious, politically conscientious literature began to emerge. One of the great questions of Augustan Age literary history is the extent to which Augustus and his agents exerted control of literature before and during his term as emperor. In other words, were poets like Horace and Virgil free to pen whatever works they liked, and, due to their talents and reputations, enjoy imperial subsidies? Or, on the contrary, were their works carefully policed and censored, and could they face a cancellation of payments, or worse, imprisonment and death, if their poems criticized the new regime? Or was it something in between – did the Augustan Age poets enjoy a relative freedom of expression but stand to gain more through writings that extolled Augustus and his lieutenants? We will explore these questions extensively in this and upcoming episodes on the period, but we’ll of course do a lot more than that. Horace, who was born in December of 65 BCE, came of age at a time when the Roman Republic was entering nuclear meltdown. Around the time of Horace’s second birthday – in December of 63, Cicero was consul and he uncovered the second Catilinarian conspiracy. As this drama unfolded – as Julius Caesar, and Cato the Younger, and the firebrand Clodius Pulcher, and Cicero himself debated what to do with the guilty conspirators – nearby, Julius Caesar’s niece Atia was holding her two month old son, a patrician newborn of no particular distinction who would eventually remain the last man standing in the three decade long bloodbath that was about to unfold. Augustus, born Gaius Octavius, was about two years younger than Horace. In 63 BCE, no one on the planet would have wagered that little Gaius Octavius would ascend to an unchallenged rulership, nor that two year old Horace would eventually become his poet laureate, and even less that Virgil, who was in that year a seven-year-old tyke poking around the far off countryside of Cisalpine Gaul, would write one of Earth’s great epics under the sponsorship of the Augustan regime. When these three were little boys, the eyes of the Roman world were on the first triumvirate – on Caesar, Pompey, and Crassus. This triumvirate formed when Horace was six. A year later, Caesar was embroiled in the conquest of Gaul. Five years afterward, in 53 BCE, Caesar had chopped his way through most of modern day France and Belgium. Crassus, in search of his own military legacy, went to fight the Parthians on the border of modern day Turkey and Syria and was killed in the spring of 53. In 50 BCE, when Horace was 15 and Octavius just 13, Caesar wrapped up his campaigns in the north, and early the next year, to the rage and consternation of the Senate, crossed the Rubicon with his battle-hardened army, setting off a civil war. Eighteen months later, in August of 48, the main phase of the civil war ended with Pompey’s defeat at the Battle of Pharsalus in central Greece. Vicenzo Camuccini's The Death of Caesar, 1804-5. In the months after his adopted father's assassination, Octavian had to be extremely crafty about how he adopted the legacy of his benefactor. By the time Octavius turned 17, his great uncle Julius Caesar had become the most powerful man in Rome. Personal connections to the dictator must have given Octavius a sense of power and entitlement even as a teenager, and after the shock of Caesar’s assassination in March of 44 BCE, Roman power brokers received a second shock when Caesar’s will announced the adoption of young Octavius as his son and the conferral of three quarters of Caesar’s immense fortune to the young man. From being a respectable blue blood, Octavian at age 19 found himself in possession of more money and political cachet than anyone else in the Roman world. He also found himself facing sudden and contradictory imperatives. On one hand, his adopted father and benefactor, adored by the Roman public, had been killed. On the other, Octavian was too smart to fall into the trap of appearing as an aspiring dynast and stepping into the openly hubristic shoes of his murdered father. Caesar had overstepped, and Octavian knew it. Nothing if not prudent and calculating, Octavian would later favor the motto festina lente, often translated as “make haste slowly,” or “slow and steady wins the race.”3 Yet as the summer and autumn of 43 BCE wore on, the future emperor was not given a great deal of time to plan and act. Octavian began his political career in the limelight with some very circumspect decisions. Julius Caesar had stipulated in his will that the commoners of Rome received 300 sesterces each, and 19-year-old Octavian made it happen. Octavian put on games celebrating Caesar’s victories in the north, which served the dual purposes of glorifying his adopted father and pushing popular opinion further and further against those who had murdered him. As 44 BCE lengthened, Octavian forged an unlikely alliance with the Senators still in Rome, who understood the extent of the young man’s wealth and the significance of his popular reputation, but must have at the same time felt leery about his relationship to the murdered dictator. Against this would-be tyrant, by the winter of 44-43, stood a formidable but motley collective. There were, first of all, the assassins of Caesar who’d been chased out of Rome by Antony’s rabble rousing, chief among them Brutus and Cassius. There were many old guard Republican senators, among them Cicero, who may not have had a hand in killing Julius Caesar but nonetheless wanted the Republic preserved at all cost. These old guard senators found young Octavian a risky, but potentially very useful ally. Octavian, the adopted son of Caesar, had popular currency with the Roman man on the street, but was also young, militarily inexperienced, and incredibly rich. Provided that Caesar’s adopted son was with them, the Roman senate could go after Mark Antony. Considering the foresight and political instinct that Octavian showed later in his career, he must have understood that many in the senate regarded him as merely the lesser of two evils. Whatever he believed about his precarious political position, he was given command of a large military force, supported by both of that year’s consuls. Up in Cisalpine Gaul, or northern Italy, Mark Antony had laid siege to a Republican army. And Octavian, in two separate battles in mid April of 43, defeated Antony’s forces and lifted the siege, saving the life of a general named Decimus [DESS-ih-muhs] Brutus, not to be confused with the more famous Marcus Junius [JUNE-ee-uhs] Brutus. What happened at the beginning of that summer changed Octavian’s allegiances. The general whose life Octavian had saved, Decimus Brutus, had been instrumental in the plot to assassinate Caesar. Saving the life of one of his adopted father’s killers must have tested Octavian’s feelings of loyalty to the senate, and this loyalty was tested further not long afterward. During the battles against Antony in April of 43 BCE, the two consuls accompanying Octavian had been killed. This left Octavian in sole control of a large branch of the republican army, and meant that Octavian was the highest ranking survivor of the campaign to defend republican interests in the north. Octavian, we can expect, thought that he would get some sort of reward or recognition for this achievement. Instead, the senate lavished honors on Decimus Brutus for the victories against Mark Antony. Perhaps anticipating a triumph and all the rewards of a victorious Roman military man, Octavian found that all of these would go to a general whom he had rescued, and who had murdered his adopted father and benefactor. Octavian did not ignore the slight. Not to be passed over for one of his adopted father’s assassins, Octavian refused to return to Rome with his forces. He demanded a consulship for the year of 42. And, perhaps thinking of Mark Antony in a different light – after all, Antony had remained loyal to Caesar through and through – Octavian demanded that Antony be removed from the senate’s list of public enemies. When this request was denied, Octavian led his army south, intent on receiving his consulship and chastening the senate for ignoring him and his requests. And in August of 43, seeing Octavian on their doorstep with eight legions, the senate and other pro-republicans, having little to muster against him, decreed that Octavian would be a consul in 42, at the shockingly young age of twenty. Then, in October of 43, a pivotal meeting took place between Octavian, Mark Antony, and military man Lepidus, whose loyalties, like Antony’s, had been toward the Caesar. These three formed the Second Triumvirate. One of their immediate actions was the creation of a proscription list, a list which, according to different sources, included at least a hundred senators and perhaps as many as three hundred, along with 2,000 equestrians, or lower aristocrats. These were men the triumvirs wanted dead either for their political alliances, or wealth, or both. The most famous victim of the purge was Cicero, murdered and chopped to pieces in the early winter of 43, his severed hands and head in retrospect symbolizing the end of the culture free speech which had so long been a part of the Roman republic. Horace, as I said before, was born in 65 BCE in a town called Venusia. If you picture the boot shape of the Italian peninsula, Venusia is right around where the ankle would be – a little less than 200 miles southeast of Rome as the crow flies. In one of the many autobiographical moments in Horace’s poetry, at the end of his first book of Epistles, Horace writes a compressed statement about his identity. It’s a characteristically humble statement – and we’ll talk a lot about Horace’s persona in his poems soon. For now we can say that among many things, Horace was a satirist, and one of his favorite things to make fun of was himself. Self mockery, in an era during which men were declaring themselves and their fathers gods, and commissioning oversized statues and temples for themselves, is a reliably refreshing ingredient in Horace’s poems. Anyway, one subject that comes up in that quote we just read is Horace’s father, who was a freedman, or former slave, who seems to have worked by commission as a money collector for an auction house.6 And Horace, who is rarely guilty of pomposity, is utterly clear about his love for his father. Here’s a quote from his first book of satires on Horace’s dad. So, if there’s any grain of truth in the autobiographical portions of Horace’s poems, Horace’s earliest memories of his father were positive, and for the rest of his life the poet recalled a happy boyhood amidst the rolling hills of Venusia. He also recalled the events that led him to leave Venusia. Speaking of his father, Horace wrote that “A poor man he was, with a meager plot of land, but he didn’t want to send me to [the local] school. . .No, he was brave enough to transport his young son to Rome, to receive instruction in the same accomplishments as any [equestrian] or senator would teach offspring of his own” (Sat 1.6.70-1, 75-8). Horace explains in this same passage that his dad helped him acquire the appearance of financial prosperity and set him up for success not commonly available to a freedman’s son. Horace’s studies in oratory and literature were broad and encompassing. When Augustus, who had just turned twenty, was meeting with Mark Antony and drafting up a death list thousands of names in length in October of 43, Horace was off studying in Athens, as many young Roman men did. Horace himself turned twenty-two that December, and at some point he fell in with Marcus Junius Brutus and co-conspirator Gaius Cassius Longinus [lawn-JINE-uhs]. Brutus and Cassius, chased out of Rome a year and a half earlier by Mark Antony, were by the autumn of 43 the last best hope of the Roman republic. The two most famous assassins of Caesar had amassed a powerful military force in the east, and in spite of the Second Triumvirate’s efforts to kill the senators and city council members who opposed them, republican loyalists continued to trickle in with Brutus over in Greece. The location of Philippi, where the last champions of the republic fell and Horace fled from the battlefield. Image by Marsyas. We don’t know why Horace joined the would-be liberator army. Since Octavian ultimately won, Horace had good cause not to bring the subject up much in his poetry. Classicist Betty Radice writes “There is no suggestion that, like Cicero’s son, [Horace] had any strong political feelings against tyranny; he is more likely to have joined Brutus on romantic impulse or simply to go along with his fellow-students.”7 Whatever his impulses for doing so, Horace took a position as a tribune in Brutus’ army, and stayed with the republicans up until the bitter end. At two separate engagements in October of 42 BCE, the triumvirs fought the republicans, and in the second engagement, the republicans decisively lost. A few miles in from the northern Aegean coastline, in the foothills of modern day Greece, the hopes of the republic were extinguished. Horace darkly recollects serving in “the broken line at Philippi” (Ode 3.4.27) in one of his odes.8 Another ode is addressed to an otherwise unknown comrade called Pompeius. Horace tells his addressee, “With you I knew / the rout at Philippi and my shield, / to my shame, left behind / where manhood failed and words / were eaten” (Ode 2.7.9-12). piece of equipment which I left, unwillingly, beside a bush. Myself, I’m safe. What do I care about that shield? These lines came from the early Greek lyric poet Archilochus, whom Horace idolized, who lived way back in the early 600s BCE. We don’t know the exact context of this quote, but Archilochus certainly seems to count it as no disgrace to have left his gear behind on the battlefield. Thus, maybe, decades after Horace’s own terrifying loss at Philippi, he offers a story of defeat and abjection on the surface, underneath which is a message of poetic self assertion. Poets might lose a shield on a battlefield, both Archilochus and his devotee Horace imply, but they survive to write another day. This story – the story of Horace chucking his shield down on October 23, 43 BCE and running for his life at the last battle between the Second Triumvirate and the republicans in the hardscrabble country of what was then Macedon – this story is a good introduction to the way that we read Horace’s poetry, in general. First of all, Philippi marked the end of 21-year old Horace’s brief military career. After the victory of the Second Triumvirate, Horace writes in an epistle, “As soon as Philippi discharged me. . .brought down to earth with clipped wings and stripped of my father’s / home and estate, poverty made me bold and drove me to write verse” (Epis 2.2.49-51). In other words, the Triumvirs took Horace’s family property and left him only with his life and the skills conferred on him by his education. It’s difficult to imagine that Horace coasted into the 30s BCE with any sense of happiness about how things in the previous decade had gone. However much he’d believed in the republican cause, he had risked his life to save Rome’s ancient political structure, and must have seen similarly minded friends and acquaintances die awful deaths on the battlefield. His father had set young Horace up with all the opportunities that he’d never had, and just as Horace was on the verge of beginning a career, he was swept up a war that his side lost. Following the military defeat, Horace’s family property was confiscated and he was left destitute, grateful, perhaps, for his life, but with ambivalent feelings at best for Octavian and his fellow triumvirs. Poetry can be confessional. It can be transparently autobiographical. But it can also operate on many layers simultaneously, as when we see Horace admitting to abandoning his shield, but at the same time subtly equating himself with a great poetic predecessor. One of the fascinations of Augustan age literature is precisely this ambiguity, and our desire to determine, over 2,000 years after Horace wrote about his life and times, what he might have really felt. A coin minted in 41 BCE featuring Antony with Octavian. Photo by the Classical Numismatic Group, Inc.
Later in life, once the wars ended, Octavian would soften and to some extent adopt Julius Caesar’s mantle of clemency. In the 30s BCE, however, the future first emperor of Rome could occasionally be almost diabolical. During this decade, in addition to sparring with one another, the triumvirs were also fighting against Sextus Pompeius, the son of the famous general Pompey. When Sextus Pompeius was finally defeated in September of 36, he had in his forces some 30,000 escaped slaves. Octavian sent the bulk of them back to their owners. As for the 6,000 whose masters couldn’t be tracked down, Octavian ordered all of them crucified. As awful as this murder was, perhaps an even more famous anecdote about the young Octavian’s propensity for violent retribution is printed in the pages of Suetonius. This lurid account of Augustus tearing out a victim’s eyes may or may not be true – Suetonius is particularly liable to sensationalized retellings. But whether or not Augustus personally tortured people to death and then lied about their disappearances, it’s clear from many diverse sources that as the 30s BCE passed – as Octavian and Horace lived through their twenties and early thirties – Romans couldn’t dig graves quickly enough to bury one another. The war with Sextus Pompeius, which, again, wound up in the autumn of 36, was surprisingly costly and tactically challenging. In the east, during these same months, Antony was retreating from Parthian territory with a giant but hobbled army, having lost tens of thousands of soldiers and failed to take the Parthian capital of Ecbatana in spite of Cleopatra’s contributions to his army. By the end of 36 BCE, Sextus Pompeius was defeated and it seemed that renewed efforts against the Parthians would be futile. Perhaps the average Roman hoped for an end to the nearly continuous warfare that had been cutting his countrymen down for fifteen years. No such respite was coming any time soon. Just a few weeks after the defeat of Sextus Pompeius, Octavian stripped the third triumvir Lepidus of most of his titles. The two had squabbled over who would control Sicily after it was taken from Sextus Pompeius, and defections in his own forces caused Lepidus to surrender to Octavian’s mercy in late September of 36. The triumvirate was now a biumvirate. Antony, on the cusp of turning 50, was growing increasingly attached to Cleopatra and the decadent lifestyle available to him in the court of Ptolemaic Egypt. Octavian, approaching the age of 30, was more ambitious than ever. Octavian also had a new reason to turn on Antony. Upon the death of Antony’s rabble rousing wife Fulvia in 40 BCE, Antony had married Octavian’s sister Octavia. The idea, of course, had been to consolidate relations between the triumvirs, but the plan backfired when Antony and Octavia separated toward the end of 36. Octavia returned to Rome, and Antony to Cleopatra and Egypt. It was becoming increasingly clear that Antony saw Alexandria as his home. Octavian wanted his last surviving opponent neutralized, but he had to wait two years for an excuse to march against the older man. The excuse came in 34. Antony gave Cleopatra the title of Queen of Kings and declared that their son Alexander Helios would be the king of Armenia and the distant east. Their daughter Cleopatra Selene would control the central part of North Africa. Their young son Ptolemy Philadelphus would rule Syria and the south central part of modern day Turkey. And most vexing of all to Octavian – the thing that may have spurred him into action most of all – was that Julius Caesar’s 10-year-old son Caesarion, the son that Caesar had had with Cleopatra, would rule Egypt as the king of kings. Octavian, whose fortunes had risen after the dead dictator had posthumously adopted him, could not let this stand. The Battle of Actium, in all of its details, is elaborately alluded to in the pages of the Augustan Age poets. Image by Future Perfect at Sunrise. For several years, the dying Roman republic prepared for its final civil war. As people consolidated into the two opposing camps, 300 senators defected to join Antony, having witnessed Octavian’s chillingly singleminded pursuit of absolute power. The outbreak of war was inevitable by the beginning of 31, and in order to finance his campaign, Octavian forced the inhabitants of Italy to surrender a fourth of their annual incomes. Although rebellions flared up, Octavian had the military strength to quell them, and by the spring of 31, he was ready for the showdown that would end the republic and begin the empire. I’ve spent a fair amount of time upfront here talking about the civil wars that ended the Roman Republic, because these wars frequently come up in Horace’s poetry. I want to look at some of these war poems now, because they come in very different shapes and sizes. Horace wrote a lot of different kinds of poems on the subject of war. They were written during the Augustan regime, but they were also written earlier – during the civil wars of the 30s. Horace’s war poems range from hawkish and militaristic to pacifist, but more often than not Horace imagines the plight of the common Roman, caught up in fratricidal campaigns against his fellow countrymen. Before we dive into Horace’s poetry proper let me say one more thing. His output included two books of satires, one book of epodes, four books of odes and two books of epistles. I’m going to be quoting from all of these in the remainder of this show, and for the sake of brevity I won’t tell you which genre and which book and which particular poem I’m quoting from, quote after quote, in the audio version of this program. If you want to track any of it down, though, as you likely know I publish free transcriptions of each episode on my website, complete with line numbers and footnotes. As I said earlier, quotes from the satires and epistles will be taken from the John Davie translation, published by Oxford University Press in 2011, and also, quotes from the odes and epodes are taken from the W.G. Shepherd translation, published by Penguin Classics in 1983.
audible even to Parthian ears? is not incarnadined with [Roman] blood? Why do your hands draw swords from scabbards? on battlefields or Neptune’s realm. . .
ferocious only to alien kinds. Does blinded frenzy possess us? Some sharper goad, such as guilt? Reply! their capsized intellects are numb. Now, Horace’s Dulce et decorum est is indeed an unambiguous statement about the beauty and righteousness of dying for one’s country, and Owen isn’t wrong in calling attention to this rather militaristic line. However, we should remember that Horace most often writes about war with the same incredulous revulsion that Owen does, and that Horace was no propagandistic war hawk, even though he wrote a poem extolling the alleged glory and sweetness of dying for one’s country. Let’s hear that line in context as it appears in Horace’s ode. straight poverty gladly in hard campaigns. . .
A photograph of the poet Wilfred Owen (1893-1918). The poem goes on to discuss the merits of taking the less-trod path, acting nobly, and it emphasizes the inescapability of divine retribution. Even though we just read a bit of it, I wonder if those closing lines gave you pause – the ones that condemn the “cowardly backs of battle-shy youths.” Because earlier, we read lines in which Horace himself recollects fleeing at the battle of Philippi – fleeing with such desperate fear that he left his shield behind. Why would Horace admit to dashing off the field during a battle, and in an ode published the very same year – 23 BCE, by the way – condemn young men who showed cowardice in battle, as he once had? There are two answers, both pretty simple. One is that Horace’s condemnations of war tend to be about Rome’s civil wars – to Horace, these were fruitless, reprehensible wars, and perhaps he thought that fleeing from them was more pardonable than fleeing from a Roman engagement with a foreign enemy. And the second answer is that he wrote his more militaristic odes in a time when Rome was again engaging with foreign enemies. 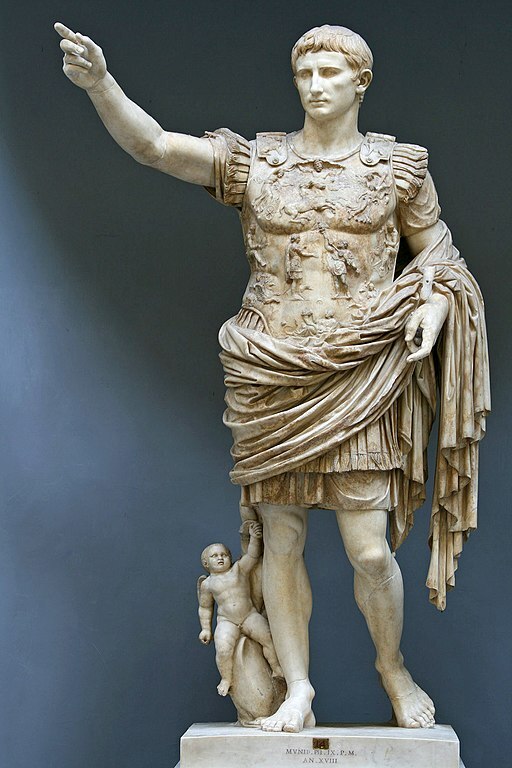 Augustus himself, in the opening decade of his long reign, gave himself command of the more fractious provinces, including Spain and Gaul, Syria, Cilicia, Cyprus, and Egypt.24 And during the years just before Horace published his famous first three books of odes, Romans were indeed crossing swords with foes in these regions and elsewhere. However much Horace detested civil war, he generally seems to be on board with the hawkish expansionism of the Augustan period. If you think about it, it is a bit peculiar that Rome’s most famous period of literary history immediately followed its most catastrophic decades of civil war. The civil wars claimed the lives of a number of prominent poets whose names we know but works we don’t possess – Helvius Cinna, Cornificius, Cassius Parmensis, Ticida, and others. While the production of literature was halted by the deaths of those who produced it over the 40s and 30s BCE, these same decades saw huge casualties in the aristocracy and prominent commercial class. Men and women who could have otherwise supported up and coming writers were slaughtered at the demands of proscription lists, killed in battle, impoverished by seizures of property and land, and exiled to the boundaries of the Roman world. And yet with the rise of Augustus also came Rome’s most influential writers, a quintet who have dominated studies of Latin literature for thousands of years. Stepan Bakalovich's At Maecenas' Reception (1890). Imaginative as this recreation was, there is little doubt that Maecenas hosted lavish parties that poets used to network and share their work with one another. What happened, then, to facilitate the creation and preservation of works by Horace, and Virgil, Propertius, and Tibullus, and last but not least Ovid? Let’s talk a bit about that. Augustus emerged from the end of the war with Antony in possession of vast new financial resources from the new province of Egypt. This wealth, along with Augustus’ existing fortune, was expended in literally thousands of new projects – improved roads, way stations for couriers, aqueducts, fountains, a police force, a firefighting squadron, temples, and a wide array of other public buildings. Amidst all these infrastructural expansions were libraries, too – Augustus built three in Rome during his reign. One of these libraries was folded into a new temple complex dedicated to Apollo on the Palatine Hill, a temple complex that is described in the Aeneid, and in a poem by Propertius, and another by Ovid.25 Augustus’ Rome, with its public spaces and the availability of literary texts, and its general financial stability, had the physical resources that poets needed to operate. But much more importantly, it had a patronage system, a patronage system that supported not only artists, but all sorts of men and women who helped abet the careers of the rich and powerful. Earlier, we heard of how Horace and his family lost their property during Rome’s civil wars. At some point in the 30s, Horace was given a position as a scriba quaestorius at the Roman treasury, serving as a scribe or clerk for the quaestors who ran Rome’s financial affairs. However he obtained it, it was an undemanding civil service job that allowed him time to work on his poetry and make connections with other literarily minded inhabitants of the Roman capital. While working as a civil servant, and we don’t know exactly when, Horace befriended the poet Virgil and another poet whose works have not survived, and these two writers introduced Horace to a man named Gaius Cilnius Maecenas, whom, when I mentioned him earlier, I called Augustus’ left hand man. To understand Augustan age literature, you need to know a bit about Maecenas. Maecenas is a very important, but rather idiosyncratic figure in this peri od of Roman history. He is most famous for enabling the poetic careers of Horace and Virgil, and generally serving to help Augustus invest his money in the arts. Suetonius offers the following description of Maecenas. 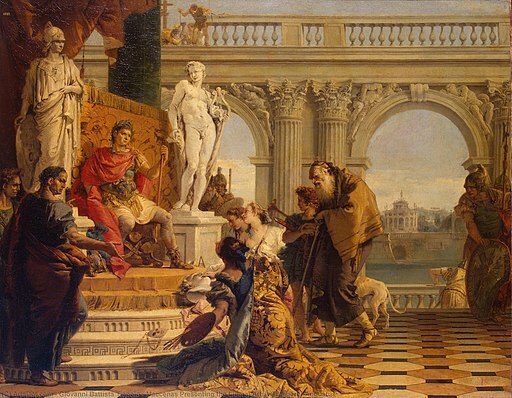 Giovanni Battista Tiepolo's Maecenas Presenting the Liberal Arts to Emperor Augustus (1743). I presume the man on the lower left is supposed to be Maecenas, gesturing to the artists showcasing their projects for the emperor. Imperial patronage, then, brought Horace from rags to riches. An easygoing and likable personality, together with an expansive poetic imagination and literary education caused him to come to the attention of Virgil and his friend Varius, and thereafter Maecenas and Augustus himself. This top-down model of artistic sponsorship is a good way to begin to understand how literature was commissioned during the Augustan Age. Scholar Peter White invites us to also remember that “Poetry in this milieu was not merely a common taste but in some degree a communal activity. Its devotees wrote together and read their work to one another, offered suggestions about possible subjects, and exchanged criticism of results.”28 Thus, Horace, Virgil, dozens of other poets, and over them a small handful of patrons, including Augustus himself, formed a heterogeneous workshop, out of which came Rome’s most influential texts. That “dozens of other poets” part is important to remember. Only the works of Horace, Virgil, Propertius, Tibullus, and Ovid survive today, but there were far more writers operating in Augustan Rome than this small set. Classicist Peter White, who counts about three dozen names of poets alongside the five whose works we now have, writes that “For a critic seeking to generalize about Augustan poetry, the abundance of poets creates an obvious problem of extrapolating from five who are extant and knowable to some three dozen others who are not.”29 In other words, we’ve lost about 90% of the poetry produced in Rome during the Augustan Age, and it’s important to remember that the Aeneid was one of many Roman epics. Additionally, there were other patrons operating in Rome than the emperor and his cultural superintendent Maecenas. While Maecenas was the main patron of Horace and Virgil, Ovid and Tibullus express gratitude toward a man named Marcus Valerius Messalla Corvinus, a former general involved with Augustus’ postwar building projects during the 20s and 10s. Names of other patrons emerge in Juvenal’s later history – Proculeius, Fabius, Cotta, and Lentulus.30 And there seems to have been no stigma against having many patrons simultaneously – surviving books of Augustan Age poetry unabashedly contain compositions directed to several different patrons. The line between patron and poet was often indistinguishable. One important figure from the Augustan period whose works are now lost was called Asinius Pollio. Pollio was one of the all around most valuable and important contributors to Roman literature and historiography during the Augustan regime. Formerly a consul and general, Pollio had walked a middle line throughout the civil wars, and emerged during into Augustan Age unchastened for his refusal to be involved on either side at the Battle of Actium. Pollio knew Horace and Virgil, and for his patronage to the poets received dedications in some of Virgil’s eclogues and Horace’s odes. Pollio was also a decent poet and an energetic historian, writing works that were used as references for later Roman historians like Plutarch and Appian whose histories have survived.31 While he had resisted allegiance to Augustus during the civil wars, in the 20s Pollio was at the helm of Augustus’ sponsorship of the arts, helping to fund the city’s libraries and their appended art galleries.32 What we know about Pollio and several other patrons suggests that Augustan Age writers like Horace were not confined exclusively to writing works for Augustus and those directly on his payroll. A variety of patrons were available, ranging from Augustus himself to various patricians on the periphery of the regime with their own ideologies and imperatives. Rome’s most famous writers, then, did not exist in something like a well-oiled totalitarian state with a propaganda ministry and constant censorship and supervision. As we’ll see in subsequent episodes, the Augustan regime was an evolving experiment, cautiously developed and deployed, year after year, and poets like Horace and Virgil were part of its evolution – not victims of some fully formed totalitarian syndicate that emerged in a puff of smoke seconds after the Battle of Actium. One of the attendees of these public readings was the emperor himself. Suetonius recollects how Augustus “generally and patiently listened to recitations, not only of poems and histories but also of speeches and dialogues.”36 Now that, I imagine, would have been an intimidating figure to have in the crowd. A patron could snip off your stipend. The public could boo you. But the emperor could do whatever he wanted. Horace, for one, was not interested in giving public readings of his work. In his first book of Satires, likely issued in the mid 30s, Horace writes, “I don’t give readings from [my writings] to anyone / except my friends, and only when they press me hard, not anywhere / or before any old audience” (1.4.73).37 A public reading, after all, could be misinterpreted, distorted through recollections of it, and reach the ears of the emperor in a form disadvantageous to a poet. Horace preferred to deliver copies of his original work to the emperor, rather than having Augustus hear about it secondhand. One of his epistles, written to a soldier or courier called Vinius, cautions the emissary to deliver Horace’s work to Augustus under Horace’s seal – and to drop them off only if Augustus is in a good mood. This same epistle tells Horace’s messenger not to be officious in his mannerism, not to carry the books in his armpit, not to reveal if he had sweated on the scrolls carrying Horace’s poems, not to trip and crush them as he began his journey to the emperor, and moreover to show exquisite care that Horace’s poems reached Augustus on good terms, exactly as he’d written them. Horace, put simply, knew what was at stake when it came to countenancing the emperor with poetry. In a sentence, the dedications and addresses to patrons in Augustan Age literature are a mixture of hyperbolic flattery, genuine friendship and gratitude, and subtle self assertion. A line in one of Horace’s epistles showcases this span of different elements. Horace writes that “To achieve great deeds in war and to display the captured enemy to one’s fellow citizens is to touch the throne of Jupiter and to scale the heavens: but to have found favour with leaders in society is not the lowest form of renown” (Epis 1.17.33-6).38 The praise of Rome’s great martial leaders here is hackneyed – they are giants who touch the clouds. Great. But there is also a crafty element of self promotion – Horace indicates that being patronized by the strongmen who control Rome’s military and economy is also no small achievement. so writers often defile glorious actions with their ugly verses. . . These lines are, at first glance, a self-abasing apology – Horace’s literary talents are insufficient to the emperor’s grandeur, and Augustus deserves better. But Horace’s famous letter to Augustus is also curiously gutsy, saying that, whatever requests had been made to him, Horace wasn’t going to undertake the enormous task that Virgil agreed to. The epistle to Augustus shows that although the emperor had a stable of poets around him, and although these poets often heaped praises on him, they were not slaves, required to write at the snap of his fingers. Jean-Baptiste Wicar's Virgil Reading the Aeneid to Augustus, Octavia, and Livia (1790-3), one of the more famous images of Augustan Age patronage. Virgil appears rather youthful for a journeyman poet in his mid-forties! Further, it is actually a fixture of Augustan Age poetry for a poet to reveal that he has been requested to write a full scale epic. As scholar Jasper Griffin astutely observes, “The poets all profess to be under pressure to produce patriotic and martial epic, to the glory of a dynast. The suggestion is flattering to both parties.”41 So, we can read Horace’s delicate refusal to Augustus as genuine shame and self-criticism. But we can also read it as self-promotion. He didn’t have to publish his refusal letter, after all, but Horace wanted all of Rome to know that the emperor had asked him for a grand epic like the Aeneid, and that Horace, preferring shorter works and shorter workdays, had turned Augustus down. We could quote dozens of places in Horace’s poems where a patron receives lavish praises. Generally those addressed to Maecenas are warmer and more familiar – the two were very close friends, after all – than the ones addressed to Augustus.44 But let’s move onto a slightly different topic. While Horace’s poetry is filled with appreciative addresses to patrons, it also contains a number of meditations about patronage itself – the ethics of the system and how it worked. Horace knew that his poems were part of a system of transaction – of product and reward – and believed that a specific decorum governed this system. At first glance these are odd lines to discover in Latin poetry. They sound like they could be printed in a manual for international espionage. But if you think about it, the circle of poets who had access to the emperor and his subordinates were in a special position. They were interested in literature, first and foremost, but they were also nodes in a network of influence and money, and potential access points for outsiders who wanted to cultivate their own relationships and transactions with Rome’s elites. Part of making a career for oneself in the patron-client system of Augustan Rome was thus having a well honed political acumen – an ability to differentiate between the blandishments of grasping outsiders and the earnest efforts of genuine poets and friends. One of Horace’s satires is written on just this subject. An early satire tells the story of Horace running into a chatty stranger who knows who Horace is and desperately wants access to Maecenas’ inner circle. The stranger promises Horace, “You’d have an able assistant, one who could play a minor role, if you saw fit to introduce [me to Maecenas]; damn me if you wouldn’t send all the rest of them packing.” (Sat 1.9.45-8)48 Horace resents the stranger’s misconception that Maecenas’ circle is competitive and backbiting, but the social climbing stranger continues to reveal a revoltingly unscrupulous ambition. “I won’t sell myself short,” he tells Horace, “I’ll bribe [Maecenas’] slaves; if I’m denied access today, I won’t give up.” (Sat 1.9.57-9)49 Here, and elsewhere, Horace draws satirical portraits of aggressive outsiders – outsiders whose clumsy attempts to headbutt their way into the delicate world of Rome’s client and patron system are both pathetic and amusing.50 Strangers might seek shortcuts through Rome’s center of power, but Horace makes it clear that Rome’s patronage system is characterized by gentility and artistic merit, and not boorish and inelegant ambition. In the passages we’ve just discussed, we’ve seen that Horace had a sophisticated understanding of how a client ought to act toward his patron, both within and outside of his poetry. He could heap glorifying praises on Augustus. He could speak of Maecenas with heartfelt gratitude and amity. He could, in passages dealing with any of his patrons, tout their merits while at the same time craftily tipping the hat toward his own. And he could offer seasoned advice on how a client ought to conduct himself in order to steer clear of intrigues and enjoy a mutually beneficial relationship with his patron. There’s just one more thing we should talk about in regards to Horace and the issue of patronage, a small but extremely important topic in Augustan Age poetry. 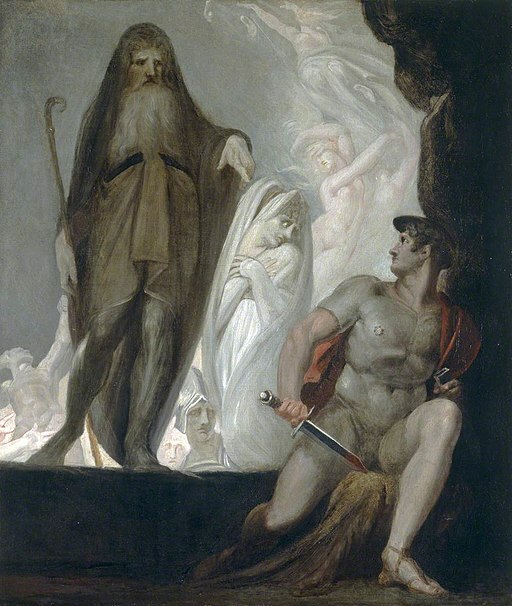 Johann Heinrich Fussli's Tiresias Foretells the Future to Odysseus (c. 1800). It's a pivotal scene in the Odyssey, and a funny one for Horace to convert into a satirical story about Rome's patronage system. Scholars have often looked for signs of subversion, or secret bitterness toward the postwar social order in the lines of Horace and his contemporaries. In other words, we can’t help but wonder whether or not Horace, or other writers whose lives had been upended by the civil wars that Augustus was central to funding and spurring on, slipped criticism of the new regime into the literature that they wrote. Now this is a huge and fascinating topic, and the slightly later Augustan poets Propertius and Ovid probably have a bit more subversive content than Horace himself – we’ll get to that soon – but even Horace, in a few scattered places, seems to reveal that writing poems for patrons in a newly minted autocracy was not the summit of his youthful hopes and dreams. The fox slithers in, helps herself to the bounty of humanity, but in the process, it seems, she becomes too bloated to get back out the way she came in. In both of these stories – the stories of the horse and the fox – wild and free animals use, enjoy, and then cannot escape from the plentitude of humanity. I don’t know whether these two allegories were written with Rome’s patronage system in mind, nor whether the story of Odysseus and his prospective patrons is a dour take on how dynamic young moneyless Romans cajole decadent patricians. Literary critics, particularly modern ones, are utterly fascinated by the complicity of authors with state power structures, and it would take a real Latinist to assemble evidence for whether or not the sum total Horace’s poetry critiques or endorses the Augustan regime. What I can tell you at a high level is that his poetry is filled with standard adulations of his patrons, including Augustus, that his poems contain a sophisticated understanding of how to be a client to a patron in the cutthroat world of postwar Rome, and, occasionally, we see in his poems what seem to be darker musings on the poet’s ultimate powerlessness. Well, folks, this is Episode 50 of Literature and History. I’m continuing to have a great time producing this show, and watching it slowly grow. While the audience of Literature and History has continued to expand, the episode length has, since the first eight programs I released, just about doubled – the early episodes I wrote averaged in at about 7,500 words, or a little over an hour, whereas upcoming shows on Virgil, Ovid, and Seneca the Younger that I’ve already written are averaging about 14,000 words, or about two hours. That means more comprehensive coverage, more engagement with scholarship, more historical background, and more great literature, coming through your headphones or speakers. One of my side projects recently has been re-recording many of the earlier episodes of this podcast, tinkering with them and adding content to them. I’ve become a bit better at podcasting as I’ve gone along, and have recorded several hundred instrumental interludes and background pieces that run the gamut between western classical and folksy and electronic ambient, and I wanted the first batch of a dozen or so episodes to be consistent with the emerging ones. I also decided to move all the comedy tunes to the end of all episodes, just to be as courteous as possible to all listeners and make sure that newcomers to Literature and History aren’t put off by my admittedly unusual habit of writing comedy songs about books and historical figures. Bottom line, around the beginning of this summer, the whole show should be polished up to a high gloss and be as professional as possible for a wide variety of listeners. I should also be able to return more consistently to a two week turnaround for releasing new episodes, since I won’t be working double time on refashioning some of the earlier material. I have been approached by a number of groups seeking to buy ad space on this podcast. And I have told all of them, “Hell, no.” The Iliad does not have commercials. The Book of Job does not try to get you to buy prepackaged dinners. The Oresteian trilogy doesn’t invite you to play online brain training games. So Literature and History, other than when I, personally, read a great book or hear a podcast I want to tell you about – Literature and History will, I hope, never have commercials. This means that if I want any financial support, it’s going to need to be crowd sourced, and from listeners. Now, a great deal of this episode has been about patronage. We learned about how Horace worked with Maecenas and Augustus in order to make a living. We don’t have Maecenases and Augustuses any more. We just have each other. And we have a service called Patreon. And I wanted to take a minute to talk about my Patreon page. If you listen to independent podcasts like this one, you’ve probably heard of Patreon. Patreon is a website where you log in, you give a credit card number, and then pledge a small amount to support artists and intellectuals whose work you find useful or valuable. Most patrons contribute a dollar or two per month or per release. That’s it. The idea is that you find two or three projects that you want to help, and pledge a buck to each one. I started a Patreon page a while ago and never really announced it anywhere. And that made it really special when a couple dozen people who are currently listening to this sought my page out, and pledged donations without even being asked. I wanted to announce that on Patreon, I am switching from a monthly pledge to a per-episode pledge. And if you pledge a dollar or more per episode, I’ll give you each episode’s comedy song in your Patreon account as a separate file. Originally I was going to try and offer a bunch of different tiers of freebies for each episode release, but honestly I am so busy, week after week, that I don’t have any time for anything else – these little tunes are about all I have to give at this point. That’s it. I think if there’s one thing us podcasters want to communicate about Patreon, it’s that the dollar-per-show or dollar-per-month pledge is totally normal – that it’s the backbone of how Patreon works, and it’s a wonderful contribution. Patreon doesn’t charge you any extra fees, and I will say up front that I will generally try for two episodes per month. From time to time, as you’ve noticed, I don’t do a song, and I hope you won’t fault me for skimping out on that when I’m too busy. I may also send Patreon supporters some instrumental music from time to time just for fun – once in a while I do a nice background theme piece for an episode that might be worth listening to while studying or driving or something and I’ll be happy to give those to Patreon supporters, too. I like the per-episode model because if I decide to take a couple of months off, like I did last year, I’m not getting paid for doing no work. Maecenas and Horace may have thought that a one-to-one interchange of writing for money was vulgar, but I think it’s rather logical. Folks, if enough of you made the one dollar per episode pledge upon finishing listening to this episode, I could quit my job and do this professionally this month, and I’d be happy to do so for the rest of my life. We could, as a group, bring a heck of a lot of peer reviewed literature programs to a lot of people, all over the world, and I hope that the time and care I spend on these episodes – including reworking the earlier ones – will make the project useful for a coming generation of listeners. The nice thing about doing all of this myself is that donations go a long way, because it’s just me doing everything. And – uh – the dog, of course. So “Patreon” is spelled “p-a-t-r-e-on,” and my Patreon page is at patreon.com/literatureandhistory, with no dots, dashes, nor underscores. There’s a link to it on my website, too. Please, when you finish listening to this episode, head over to patreon.com/literatureandhistory and make a $1 or $2 per episode pledge. As with the previous episode on Catullus’ I want to thank Professor Aven McMaster at Thorneloe University for reading over a transcription of this program prior to its release. Her doctoral work and subsequent research has dealt with Augustan Age patronage and Latin lyric poetry, and she’s been a huge help. Her podcast, which is called The Endless Knot Podcast, is a show hosted by a classicist and a medievalist, and a really fun journey through history, etymology, literature that discusses these subjects in detail, but also brings them into dialogue with contemporary history and pop culture. Aven, it’s an honor to have you helping us through the challenging world of Latin poetry! Well, I hope this discussion of patronage during the Augustan Age has been useful. Though it’s a less dazzling a topic than some of the subjects we’ve covered in Literature and History, it will be essential for the next dozen or so episodes on the writers who worked during this period, including our next program. In this first show on Horace, we really only covered two aspects of Horace’s poetry – his poems concerning war, and the sections of his works that have to do with patrons and patronage. Next time, though, we’ll learn a lot more about Horace’s writings – his satirical style, his amusing ethics, his ideas about what literature ought to do, and more than anything, the incredibly likable personality that he projects through his poems. In an era of cant and pomposity, with self-deifying military men on one side of him and dreadfully serious ethical philosophies like stoicism on the other, Horace just didn’t take himself very seriously, and I think that his general atmosphere of levity and self-deflation is one of the liveliest and most enchanting qualities of his writing to a newcomer. So join me, next time, for a deeper look into the lines of a charming Roman everyman who broke through the end of the republic and made his way in the brave new world of Augustan Rome, in Episode 51: Horace and Augustan Poetry. There's a quiz on this episode on the website. And if you’re down for a comedy song, I’ve got one for you, and if not, thanks for being a terrific and intellectually driven human being who cares about ancient history, and have a great day! 1.^ Betty Radice’s dating is as follows. Satires, Book 1: 35 BCE. Epodes: 31 BCE. Satires, Book 2: 30 BCE. Odes, Books 1-3, 23 BCE. Epistles, Book 1: 20-19 BCE. Epistles, Book 2: just after 17 BCE. “Carmen Saeculare:” 17 BCE. Odes, Book 4: in or after 13 BCE. From Radice, Betty. “Introduction.” Printed in Horace. The Complete Odes and Epodes. Penguin Classics, 1983, pp. 13-32. 2.^ Allesandro Barchiesi is apt to remind us that “Our acceptance of the Augustan age as a well-defined period of history is deeply collusive with the strategies of self-represenation in Rome during the watch of Octavian-Augustus.” Barchiesi, Allesandro. “Learned Eyes: Poets, Viewers, Image Makers.” Printed in Galinsky, Karl, ed. The Cambridge Companion to the Age of Augustus. Cambridge University Press, 2005. Kindle Edition, Location 5017. 3.^ Eck, Warner. The Age of Augustus. Blackwell Publishing, 2007. Kindle Edition, Locations 620-3. 4.^ Quoted in Tempest, Kathryn. Cicero: Politics and Persuasion in Ancient Rome. London: Bloomsbury, 2011, p. 188. The quote is from To Atticus 363 (14.9.2). 5.^ Quoted in Horace. Satires and Epistles. Translated by John Davie. Oxford: OUP, 2011. Unless otherwise noted, quotes from the satires and epistles in this episode come from this edition. 7.^ Radice, Betty. “Introduction.” Printed in Horace. The Complete Odes and Epodes. Translated and with Notes by W.G. Shepherd and with an Introduction by Betty Radice. Penguin Classics, 1983, p. 12. 8.^ Ibid, p. 135. Unless otherwise noted, references to Odes and Epodes come from the Shepherd translation. 9.^ See n. 1 for the dating of Horace’s publications. 10.^ Archilochus. Fr. 5.1-4. In Greek Lyric: An Anthology in Translation. Translated by Andrew Miller. Hackett Publishing Company, 1996. Kindle Edition, location 241. 11.^ Eck, Warner. The Age of Augustus. Blackwell Publishing, 2007. Kindle Edition, Location 232. 12.^ This was Asinius Pollio, who patronized both Horace and Virgil and received dedications and praises for helping them through some of their rougher patches. 13.^ Dio, Cassius. Complete Works of Cassius Dio. Delphi Classics, 2014. Kindle Edition, Location 11030. The quotes are from Roman History 48.4. 16.^ Quoted in Radice, 1983, p. 105. 19.^ Knox, Peter E. and McKeown, J.C. The Oxford Anthology of Roman Literature. Oxford: Oxford University Press, 2013, p. 223. 21.^ Radice (1983) p. 63. 22.^ For very specific reasons, too. The epode closes with a description of different ages of gold, bronze and iron (Epode 16.65-8) that echo similar passages at the close of Catullus 64, and before it the Book of Daniel, and before it Hesiod’s Works and Days, and long after all of them Dante Inf 14.94-120. 23.^ Radice (1983), pp. 130-1. 24.^ Eck (2007), location 555. 25.^ See Aen 6.69-74, Propertius 2.31.4, Ovid Am 2.2.4. 26.^ Suetonius. Complete Works. Delphi Classics, 2016. Kindle Edition, Locations 2254, 2245, 2250. 28.^ White, Peter. “Poets in the New Milieu: Realigning.” Printed in Galinsky, Karl, ed. The Cambridge Companion to the Age of Augustus. Cambridge University Press, 2005. Kindle Edition, Location 5924. 31.^ Seneca writes of Pollio’s “‘bumpy,’ jerky [style], leaving off when you least expect it. . .Pollio breaks off, except in the very few cases where he cleaves to a definite rhythm and a single pattern” (Let 100.3-4). 32.^ See Suetonius Augustus (29) and Pliny's Natural History (35.10) for descriptions of Pollio’s role in the building projects. 33.^ See White (2005), Location 5832. 34.^ Seneca Controversiae 4.2. Quoted in White (2005), Location 5832. 35.^ Suetonius. Augustus (189). Quoted in Suetonius. Complete Works. Delphi Classics, 2016. Kindle Edition, Location 2935. 36.^ Printed in White (2005). Location 6032. 37.^ Printed in Davie (2011), p. 15. 38.^ Davie (2011) p. 87. 41.^ Griffin, Jasper. “Augustan Poetry and Augustanism.” Printed in Galinsky, Karl, ed. The Cambridge Companion to the Age of Augustus. Cambridge University Press, 2005. Kindle Edition, Location 5793. A similar refusal in Horace is in Sat 2.1.12-16. 42.^ Knox and McKeown (2013), p. 223. 44.^ See, for instance, Sat 1.6 and Ode 1.1 for adoring adresses to Maecenas. 45.^ Davie (2011) p. 87. 50.^ Satire 2.8 is written on a similar subject. A nouveau-riche man throws a dinner party at which Maecenas and others are bored by the social climber’s tedious speeches about all his dinner plates – it contains many elements of Horace – a call for moderation, and a simultaneous disparagement of pretension alongside a pride that Horace himself does belong to the inner Augustan circle. 51.^ Davie (2011) p. 50. Further references to the poem are quoted parenthetically. 52.^ Elsewhere (Epistle 1.20) Horace writes of his work as a soon-to-be-manumitted slave boy who will be consumed and then shed aside after being fondled. 53.^ Davie (2011), p. 78. 55.^ Dryden, John. Essays of John Dryden. Volume 2. Translated by W.P. Ker. Oxford: Clarendon Press, 1900, p. 87. 56.^ Davie (2011), p. 33.